I'll begin this post with a confession: it's more than ten years since we did this walk. 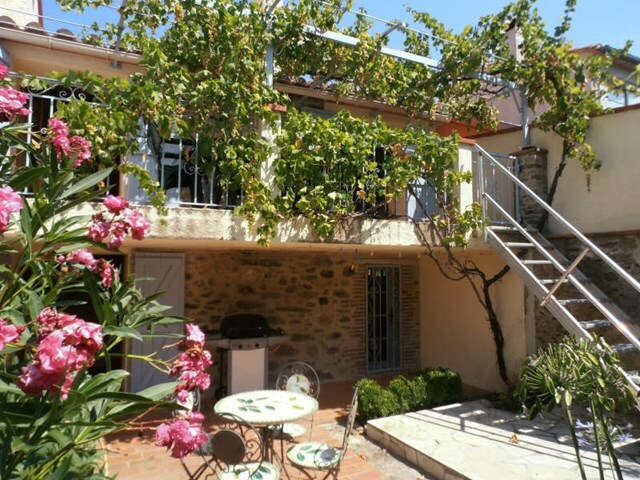 In the winter of 2006, we spent a month in a funny little Catalan cottage in Céret. It was a memorable holiday for many reasons. Firstly, our cottage had no inside staircase or downstairs loo, so every time we wanted a pee (or to go to bed - the bedrooms were upstairs too), we had to go outside and up the external stairs - never mind that it was January and freezing. Secondly, it was during that holiday that we finally decided to start the process of moving from north Norfolk to the Pyrenees. And thirdly, because we were blown away by the sheer variety of the walking: we'd be walking the coast path one day, clambering up the snowy foothills of Mont Canigou the next, and rambling around the wooded slopes of the Albères the day after. 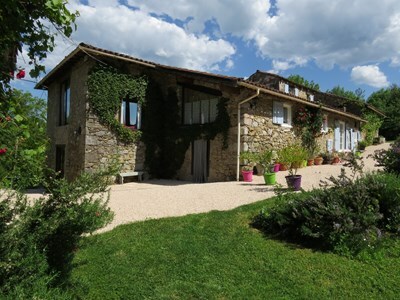 This is a relatively easy walk, perfect for French Foothillers. 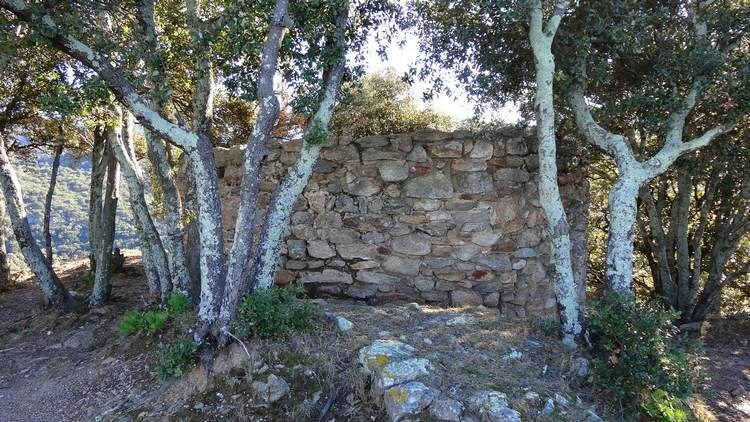 For your money you get a dolmen, a ruined tower, a cork oak woodland and some lovely views over Canigou, the Aspres and the Roussillon plain, all for the price of an overall height gain of 415 metres and three to four hours of walking. It would be a great walk for a hot summer's day as much of it is in dappled shade. We parked just outside the village centre of Maureillas (on the Céret side) then followed a small road that runs along a river and around some houses. From here, the way is well signed, and it's not long before the first views towards the Aspres started to appear. When the path split, we took the one on the left (the other one is the return route), passing some relics of a former talc mine and a lime kiln. It always amazes me that so many of the peaceful and beautiful paths in the Pyrenees go through areas that once would have been hives of industry. From here on the path got a bit (well, quite a lot!) steeper. 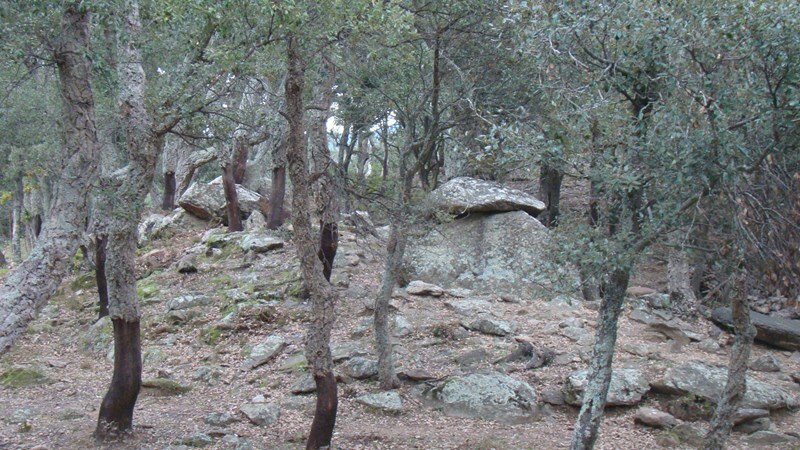 We climbed on through lush woodland and soon spotted the main cork oak plantation. Cork oak has been growing here for 8000 years, and Maureillas, like many other places around here, once had a thriving cork industry; it's somewhat declined now. There's a cork museum back down in the village, though we missed out on this bit of post-walk education this time. And then all of a sudden, there was the dolmen, surrounded by a tumulus. It was first built over four thousand years ago, then used again in the Bronze Age, between 1100 and 700 BC. It's a single chamber, which is typical of its age, and opens towards the south-east. I'm very fond of dolmen and other prehistoric stones and remains, especially those (like this one) that give off a palpable energy. We spent a good couple of hours here, just sitting by the stones. Then it was off on our return route, making the detour to the Tour Bell Ull: there's not much left of it, but the views are lovely. We'll do this walk again, soon. 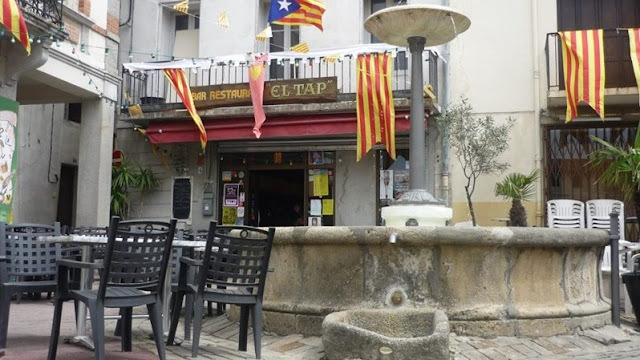 And this time, we'll head off afterwards to the bar El Tap, in Maureillas' old village square, for a beer and maybe some tapas. Highly recommended!